The V-22 Osprey is one of the most versatile planes in the military. The tiltrotor craft takes off and lands like a helicopter, but flies like a plane. That means it can drop troops in areas that can't support planes. But it's too narrow to bring a car larger than an ATV. That's where Boeing's Phantom Badger comes in. The Phantom Badger is Boeing's proposal for a tactical vehicle that can be contained within the V-22 Osprey with just six inches of room on each side. It looks a lot like the Power Wheels Jeep I had when I was a kid, just without the juice box in the cupholder. Instead of being just a rebodied ATV, the Phantom Badger is a ground-up design that bridges the gap between ATV and full on HumVee. This is just one of many proposals that should be forthcoming for a combat vehicle to be contained in an Osprey, so Boeing is keeping most of the specs close to its chest. What they did say is that it has four wheel steering, rugged suspension, and mission-specific modules between the seats. This means that it can be repurposed at a moment's notice. And since speed is paramount in the military, this is a required feature. 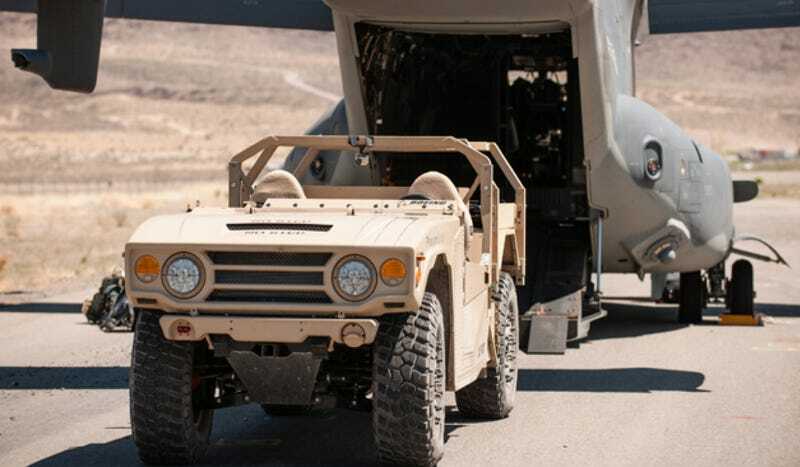 Boeing says it should be as capable as a HumVee offroad, just in a much smaller package. If it does get selected to be the tactical vehicle for the Osprey, expect to see the Phantom Badger in an inhospitable warzone near you soon.